I’ve had something of a battle with to-do list apps recently which has shown me that it’s as much about the app as it is about the way you interact with it. Your productivity really depends on the environment you manage your tasks in and the way your tasks are presented to you. With this in mind, I’m going to look at three options I’ve tested against each other over the past few months and report on what I’ve learned, both from the perspective of the features and from the perspective of the psychology of productivity. 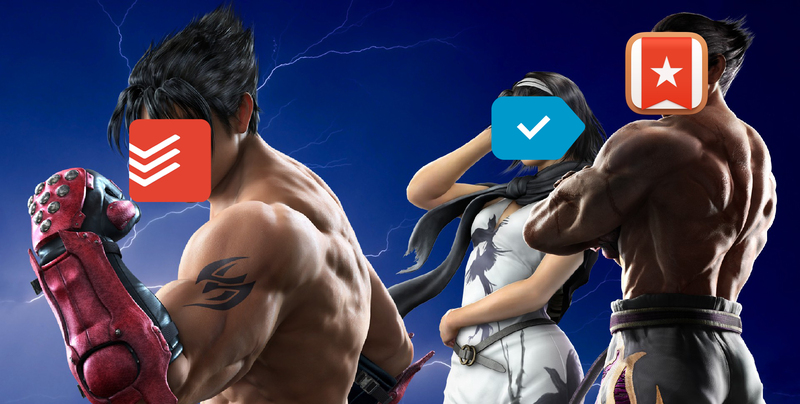 So, it’s Todoist vs. Wunderlist vs. Any.Do. Before we get into the full-blown showdown, if you’re looking for a little more choice you should check out the bonus content I put together as a companion to this post — 13 checklist apps you have to try! Todoist is one of the big players in the to-do list world, and for very good reason. 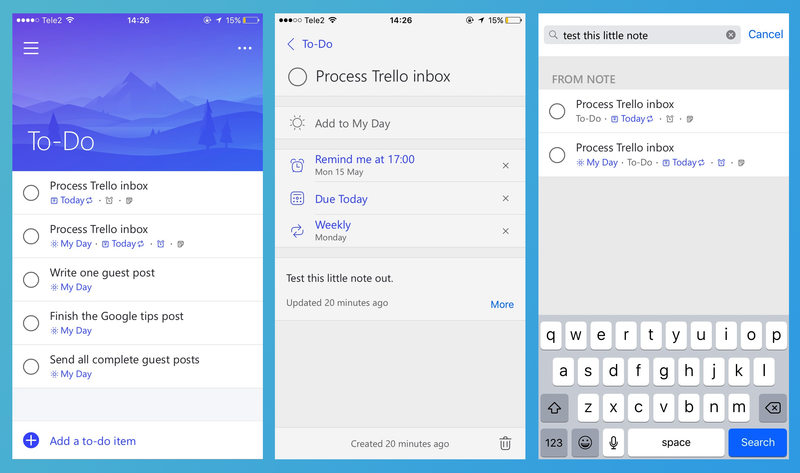 While its free version is missing plenty of features (reminders, search, emailing tasks, and more), you can probably spare $28.99/year if you want a to-do list app with extremely smooth UX. If you’re a fan of Inbox by Gmail, you’ll love how easy it is to snooze and complete tasks with the mobile app. Using my expectations from other mobile apps, I figured that this would be the case when I didn’t see any checkboxes. Todoist’s lack of checkboxes is great. Perhaps it’s my inaccurate thumbs, but hitting the right places on the Wunderlist UI is sometimes real tricky. Just the same way you can snooze emails in Gmail, you can quickly date or re-schedule an item by swiping left and then tapping one of the options. So, even though the free version of Todoist lacks most of the useful features you’d find in Wunderlist, it has such a beautifully simple UI that it starts feeling clunky to use anything else. Well played. This way, I can take the cards off of my shared Trello boards (great for collaboration) and prioritize them in Todoist (great for action). 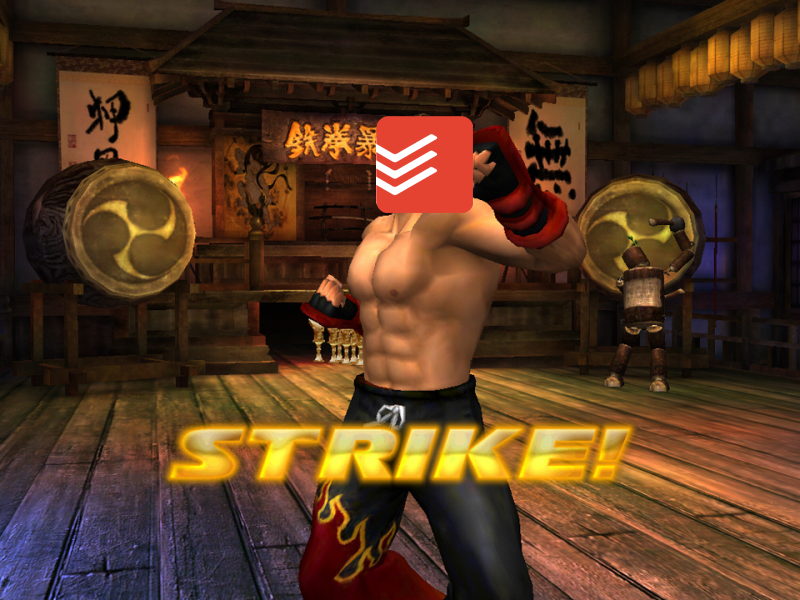 Another thing I’ve found is a plus point for Todoist is its gamification aspect: completing tasks gives you karma and lets you level up, and completing tasks repeatedly gives you a streak — and subsequently more karma. Want to level up to Enlightened? Do enough tasks to get 50,000 karma! That will likely take longer than levels 1-100 in WoW. Fantastic UI with intuitive (really, not just the way everything gets called intuitive) gestures. No reminders, search or task emailing on the free plan. But hey, a company gotta eat. No way to quickly mark a task as distinct, unlike Wunderlist which lets you star items. Wunderlist is a feature-rich to-do list app available on every platform under the sun. It supports folders, recurring tasks and integrates with Trello, Slack, and 500 other apps through its integration with workflow automation software Zapier. To give you an idea of how Wunderlist is better than a sheet of paper, I’m going to show you my current set up and how the different lists work. The Today and Week lists are smart lists, which means they’re automatically generated by the due dates you’ve attached to tasks elsewhere. I have a Work and a Home folder to separate these areas of my life. You can’t see, but in the Home folder there are lists like Shopping and Daily Recurring Housekeeping. Inside the Work folder, we’ve got Content team tasks to-do which is a shared list between myself and the other full-time blogger here, Benjamin Mulholland. Here we collaborate over our rare shared projects. We’re mostly testing it as an alternative to Trello, for now. I store all daily recurring tasks in their own folder, to keep all tasks with a repeating due date in one place. When we get to Push article titles, that’s where Wunderlist starts to stand out from the crowd. This list is linked to my Work in Progress list on the Process Street Blog Articles Trello board, and whenever I get a quick idea, I can push it to Trello where it’ll be updated with links, keywords, research material and there’ll be more discussion in there. When it’s time to start working on the idea, I can use Wunderlist to quickly schedule a due date, then update Trello when the article goes out for review. The same goes for Keywords to target, which pushes a card to a list of ideas on Trello, ready to be formulated into a title and structure when I need a post to write. Again, Push tasks is linked to my personal board on Trello to an Inbox list, which in turn feeds my Wunderlist Inbox. Neah, eh? Every morning, I go into Inbox and assign dates for a few priority tasks. If I need more focusing that day, I’ll star the two things I want to focus on and only look at other lists when that one is clear. Everything you need to organize your life. Tasks, subtasks, folders, reminders, due dates, prioritization, attachments and collaboration. 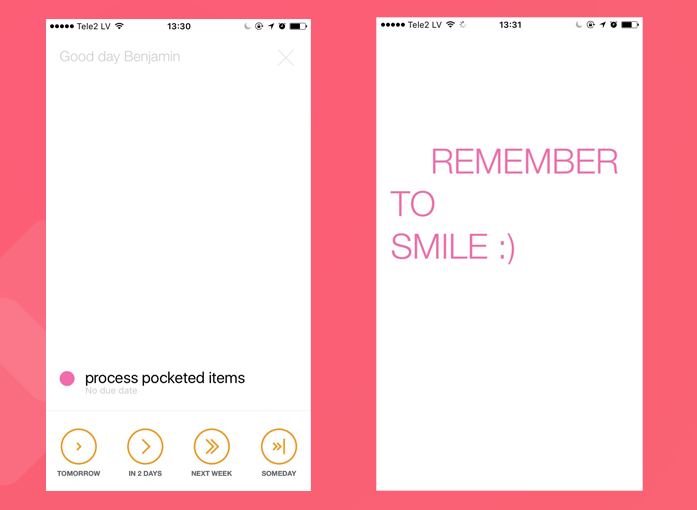 A selection of awesome backgrounds which make the app feel like it’s ‘yours’ (this is important since to-do lists are very personal). Integration with other apps. This is the single biggest thing I need in a task manager because I have to collaborate with others at work who don’t use Wunderlist. Smart lists which pull tasks in from other places depending on whether they’re due today, this week or if they’re starred. Extremely intuitive interface on mobile (aside from one minor gripe, as shown below). No ‘delight’ — nothing motivating about checking off your tasks or hitting targets. For example, Todoist has streaks and karma, Any.Do has motivational messages. Wunderlist has nothing like that. Creating folders on mobile is difficult to do, and you have to create a new list to see the option. The Windows app isn’t particularly easy to use and has some awkward issues that come as a real shock if you usually use the app on mobile. Soon enough, Wunderlist will be no more. Just like Microsoft shuttered Sunrise Calendar after acquisition, they’re doing the same with Wunderlist. Only this time, they aren’t baking it into Outlook. They’re releasing their own rebranded version called To-Do. It’s got a nice clean UI, the look and feel are customizable, and it also apparently has “an intelligent algorithm” in charge of an automatically-generated focus list. This focus list, called My Day, fills with tasks based on their due date, showing you what the app thinks you should be doing today. This comes at the cost of prioritization. Because To-Do is controlled by an algorithm that automatically sorts your tasks, there’s no way to manually prioritize them. Simple UI that looks great on web and mobile apps. Available on web, Android, iOS, and Windows 10. Due dates and reminders can be set to different values (for if you want to be reminded of a deadline the week before). The one often-overlooked feature I’m grateful for is the ability to add a due date and a reminder date to tasks. Often, you don’t want to be working on a task the day it’s due. You’ll maybe need to be reminded a week before. In those cases, a separate date for the due date and reminder is really handy, and stops you from feeling the need to process due dates every day to avoid missing a deadline. Without sub-tasks, without prioritization, and without a Zapier integration (at the time of writing), there’s no way I can say To-Do is the best app on the list. In fact, it might be the worst. Any.Do is a stripped-down list app built for mobile, with one huge upside over any other app I’ve used: Any.Do Moments. Moments is a unique way of prioritizing your tasks. Every morning, you get a notification to open Moments. 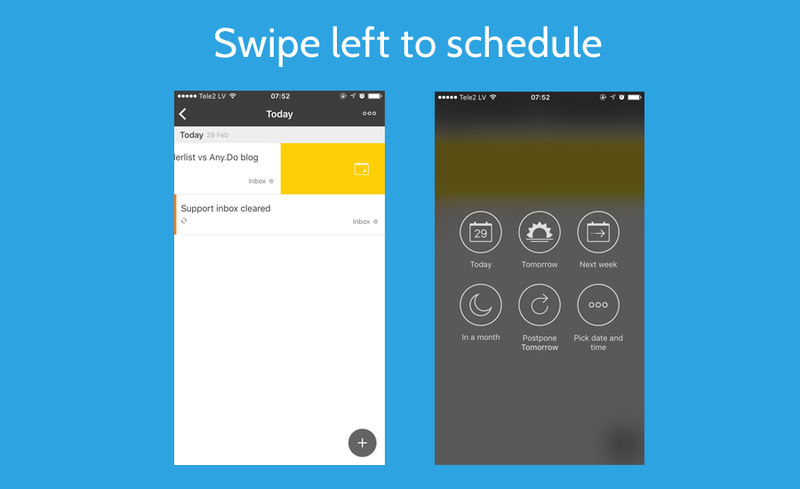 Inside, you see incomplete tasks and can organize them by due date in one tap. Once you’ve prioritized everything, you get a random motivational message and to hear a short, cheery jingle. 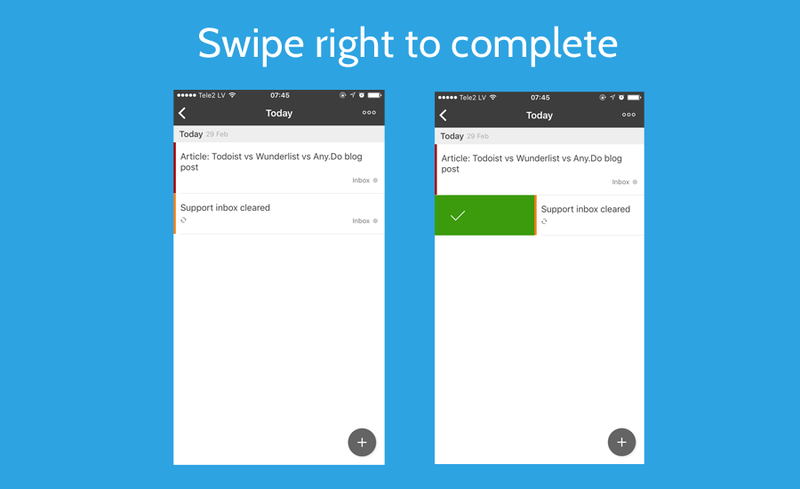 Aside from Moments, Any.Do has all of the basic task management functions. Like Wunderlist, it has tasks, subtasks, reminders, and starring. But aside from that, it has a UI so minimalistic it can be a little tricky to navigate smoothly. …And the web version feels like a drunken afterthought. Anyway, as I said earlier on in the post, the most important thing a to-do list can do is intergrate with other tools. I’m part of a pretty big team, and we use a LOT of tools. Trello, Evernote, WorkFlowy, Any.Do, Slack and Inbox to name a few popular ones. If I need to check all of these places every day before I can get an idea of what my day and task list will look like, I’ve already spent 20 minutes scanning tasks and a potential hour on top getting sidetracked. Can not integrate with anything. The information never enters or leaves Any.Do so there is NO chance for automation of any kind. Hidden options all over the place. The UI design is a little too minimal. First of all, Any.Do’s inability to integrate with anything means it doesn’t stand a chance against Todoist or Wunderlist. While using Any.Do, I was setting myself recurring tasks to process reminders from all kinds of different sources and that took up so much of my time I was missing deadlines left and right. Thanks to Wunderlist’s integration with Zapier, Wunderlist straight-up thrashes Any.Do on all fronts. Even Any.Do’s unique Moments feature isn’t enough to save it, as cool as it is. Having to process reminders into Any.Do was way too much work to handle. When it comes to Todoist vs Wunderlist, it’s a very close battle. Wunderlist is the app I currently use (I explained my full workflow with it earlier), but I’m now considering switching to Todoist, but definitely not without the premium version. In reality, we want to spend as little time inside our to-do lists as possible, so they should be predictive, smart and easy to use. While Wunderlist is reasonable, by testing Todoist I’ve gotten too used to the gestures and natural language interpretation to want to give it all up. That’s why I declare Todoist the winner by a very tiny margin. Looking for more apps to try? Check out our bonus content: 13 checklist apps you have to try! Great article Benjamin. I’ve been using Todoist for a while now and love the UI and how it integrates in my workflow. I’ve thought about using Trello and the combination with Todoist sounds awesome, so thank you for that and I’ll be looking into the possibilities. Great, Christian. If you use a whole host of other productivity apps, you should check out Zapier if you haven’t already. (here’s an intro guide) — You’ll be able to integrate hundreds of apps and save so much time checking up on everything you ever add. A huuuge problem for me was how easy it was to attach reminders to emails in Inbox. That meant I was bypassing my traditional system, and if I wanted to get those tasks elsewhere, it’d be manual and a total mess. By testing so much software, I really get myself into situations like these. Have you tried Inbox, out of interest? I have used ToDoist for years, I often try alternatives/competitors, but have simply never found anything better! Good to know, Brad! I’ll keep that in mind. I’m still making the transition. Any app apart from Wunderlist or Todoist seems so far from where it needs to be to compete. Any.Do’s web app is a disgrace! Niche shot Benjamin. I almost agree with you about Todoist. But if we have to compare both (wunderlist and Todoist) Wunderlist exist almost everywhere (even on windows phone). Further in free version it allow to backup all our data, to upload files even more than 5Mb. It accept for free to share our list with anyone with almost no restriction, to add any Tags, or assignement…. Anyway you’re right about the fact that todoist has a great UI but free version can not really compete with wunderlist free features. Absolutely, yeah Wunderlist is definitely a more ‘accessible’ solution. But unless you have several different devices spread across iOS, Microsoft, Android, etc, it isn’t a big deal in reality. Since it’s widely supported enough, it integrates with a whole bunch of different products which was the major point for me. Great review. I am irrational person by nature so I used physical notepad to keep tasks with no deadline. After some time(1 year) I moved to use Todoist. Still I saw a lot of uncompleted tasks in the end of week, which started to frustrate me. The reason was that I had number of must have items in my calendar(meetings), some tasks that I work at company with my team and other ad-hoc items on company/personal/pet-project tasks in ToDoIst. Gladly, I read this article http://www.marcandangel.com/2012/02/20/12-things-highly-productive-people-do-differently/ and completely switched to calendar driven schedule. I’m more than happy, as I don’t need to keep everything in my mind, as todoist didn’t help me much with having good enough picture of my day. Still I keep using it for some ah-hoc ideas documenting(what to look at or to read), but I don’t rely on it as main source of tasks. I think there’s a lot to be said for a physical to-do list, because it feels more serious than typing. I know a lot of people who feel like writing something down on a piece of paper helps it stick in their brain more. Did you find that? Yes, looks like that. Alternatively, you can write into paper to-do list, take a notes and then scan them into Evernote for example to keep things in your digital memory. As for hand-writing, as I know study shows it has better value in terms of cognitive function, so you will remember more most probably and develop other related cognitive skills. Nice idea! Shame that wouldn’t be indexed in search, though. 🙂 I suppose that’s where tagging comes in. Benjamin, actually, yes it would be searchable… assuming your handwriting isn’t cursive or doesn’t look like a doctor. Evernote (premium) OCRs photos. really nice if you use a whiteboard and work and want to remember it all… just take a picture and it’s searchable a few hours later. One of my primary reasons for dropping the 50 quid or so. Great piece man. I wish Any.do would integrate, as I LOVED the moments feature, but I actually took a VERY similar path to what you’ve written out here, and currently use Todoist. Thanks for commenting! Yeah, Moments is so good, I honestly wish that a better to-do list app that integrates would steal it. Or that Any.Do would at least integrate with Evernote so I could do some sort of janky chain-reaction integration connecting it to Zapier, haha. I use a 2 macs, 2 pcs, an ipad and a smartphone (I’m almost embarassed to admit that), I would be lost without Wunderlist. The ability to move seamlessly across devices is critical to me and Wunderlist for all its UI faults is simple, easy to use and everywhere. I also use a slightly mad amount of devices, so not to worry there! Yes, I’ve found that Wunderlist’s bad points are outweighed by its good points, but since writing this article I’m confused again about the best task management system! I started using Wunderlist a few days ago and I love everything about it. I thought I needed to see a monthly calendar at a glance because that’s what I’ve always done but wunderlist is changing that mindset (I’m 63). Smart lists and smart due dates shows me what I need on a daily and weekly status by organizing my to do’s I’ve added in Wunderlist. A nice addition would be to see a “Monthly” list and that would truly keep me away from needing/wanting to see the traditional grid planner. Wunderlist now has full integration with O365, Outlook for Mac and PC. Out of the box, it clobbers the competition. While I like the Karma points and location reminders of Todoist, I get all of the the other features for free. I did try Todoist and many times, the system crashed on my. Have not had one issue with Wunderlist. Good points. I agree that the free Wunderlist makes light work of every other system, but after more thought I feel like the main reason I’d go with Todoist is the iOS interface with the swiping gestures. As it stands though, I’m actually still having trouble deciding. I’ve used Todoist over a year (premium version) and still like the clean interface. But the writing of recurring tasks with reminders is a nightmare. It needs the correct order of keywords and stuff to achieve the desired result. This things are lot easier in other apps. Todoist is not very expensive but it’s true that some paid features are already in the free Wunderlist. Wunderlist has folders (it’s a bit the same as a project in Todoist and to be honest.. if I see Todoist and Wunderlist side by side, they share a lot of similarities (except the design). I agree about Wunderlist’s free plan — it’s really generous, whereas Todoist’s is a real pain. But, converting to paid because of Todoist’s filter is definitely worth it. It becomes a lot more customizable than Wunderlist at that point. This natural language feature is also working with some other Todo apps. It works the same in Remember the Milk 4 (the new completely overhauled version from this year) but they provide an optional dialog to pick the settings…. this works miles better compared to Todoist. Why do you need to use trello in conjunction with Wunderlist? Why not just Wunderlist alone? Because I have tasks coming in from different places. I can’t control the other task management apps the rest of my team uses, but I can integrate them with my own to automatically feed it tasks. In my opinion the best to-do list is definitely Tik! It’s the easiest I know. No complicated steps, just add you task, cross it when it’s achieved. It’s that simple! +1 for Todoist. I expect the competition will keep growing stronger in the near future too. I came to the same conclusion as I was reading your article, to go with ToDoist. Part of the reason for me is my developer likes Trello and being able to tie that in is really great. Thanks for the detail of your comparison. It was exactly what I needed to make the right decision. Have you heard about FamilyInSafe? Awesome app for collaboration, free and very handy! I like the product, Marvin! And great landing page. Awesome post Benjamin. I personally prefer to use Wunderlist over Todoist because Todoist asks me to pay for just basic features like reminders. True — I have actually had quite a lot of unresolved bugginess from WL, though, so I’m happy to pay for the more stable Todoist. Fabulous article, thank you for writing this. I have been going crazy trying to figure out something that is going to work for me. Having bad eyesight and a naturally poor memory because of ADD and some additional memory impairment on top, it has been positively painful trying to navigate and decide on one that is going to work for me the best overall. I took GQues for a test drive (2 weeks trial of full version) thinking as it was a Google product, it would offer the best all arount intergration with Google Calendar and email (as per thier sales hype). Was I sadly wrong, it is extremly tempremental and the interface, whilst clean looking, is pretty crappy in my opinion. The biggest thing I disliked was I kept accidentaly deleting an item when all I wanted to do was select or reorder it. No prompt prior to deleting and the colors that were available to select from are really washed out looking and no option to set custom colors even. I am going to try To-Do list again and also test Wunderlist and Trello. Trello may work for something else I need. I am trying to to draft a navigation menu for a website and have tried a few things so far but none have been what I needed. Just something simmple to have a menu item and parent/child menu’s. I am actually trying to map how to use for Woocommerce categories/subcategories and tags and it will be in WordPress. I want to be able to duplicate items to use in more than one place or category/sub category. I need to be able to visualize just the structure (buttons) and also make sure I am not naming things in a way that may cause duplicate content or direct to the wrong colonical link. Anyway, thank you again. Are you still using To-Do and if so how is it working out now you have been using for a while? Wunderlist and Trello sound like a good option for me to at least check. I’m really glad this helped you out. I’ve never heard of GQues, but I would definitely be suspicious of managing my tasks with a Google Calendar add-on. I’ve never liked the interface, and it feels like it can be a terrible mess even when you don’t have many tasks. I use it for push notifications only, I never open the app unless I’m just adding a meeting or something. My favorite method is to link Todoist to Trello (using Zapier), so whenever I add a new card in Trello, it creates a task in Todoist. This way, I get the best of both worlds. A personal task manager and a team board where I can collaborate with others. Yep, still using Todoist! It’s going strong. My favorite feature is the natural language processing. I can type ‘clear support box every wednesday’ and it will create a recurring task for me. The only issue with the Trello/Todoist integration is that it can create an infinite loop if you set it up to also watch for cards in Trello and feed them back into Todoist. I haven’t worked out how to change that yet, (although there is a way) so I just have them linked one way for now. Keep me updated with how you’re getting on! In Wunderlist, you can definitely enter dates by typing them naturally like : “check this tomorrow at 3pm” will set a task for tomorrow at 3pm. Also works with Google voice commands in the same way. Great post! I’ve been testing out all three of these over the last month. I came to the same conclusion and have been using Todoist for the last 2 weeks and often find myself extra motivated for those karma points 🙂 I am a huge fan of the native app and the CMD + Shift + A shortcut for creating quick tasks, due dates and assigning projects! Love the idea to automate connected apps like trello, which is what we currently use here at https://shoflo.tv/ which is a collaborative event production software for live events. It got me thinking more about connecting this to even more apps like slack…something like a end of week completed tasks summary message. The advent of Echo/Alexa has changed the game. I’m a longtime Wunderlist user, and it has served me well. But for basic list functionality (such as shopping and household to-dos) I have now been forced to do something, as Wunderlist does not even have Alexa on their radar (as of January 2017!). So I have moved to Todoist. It seamlessly integrates with Alexa; items that I add or delete in either app show up immediately in the other. It also solves my (previously) biggest complaint about Wunderlist, which was the inability to clear all completed tasks from a list. Both Todoist and Alexa offer that functionality. The biggest weakness is that if those with whom I share a list check something off it, that action does not flow through to Alexa. But given the other strengths, that is a minor quibble. So for basic household list management, Todoist is IMO the only valid option at the moment. I tried any.do prior to Todoist…. it is beautiful, and its android widget contains both the shopping and to-do lists in one place. But it simply refuses to sync or update the lists. Their site says the ‘solution’ to this is to log off and log back on. Sorry, but that kills the whole concept of intuitive list usage/management. Any.do is therefore a non starter. Likewise I’ve heard some say that the solution to Wunderlist not working with Alexa is an IFTTT recipe. It the problem there is that Wunderlist has no integration with IFTTT either! So the best you can do is send a message to the Wunderlist inbox. From there, you have to assign the items to the correct list! Again, the opposite of effective list usage/management. So Todoist kinda wins by default. Won’t call it awesome, but given its fairly thorough integration with the utterly intuitive Alexa it comes up the winner in my opinion. I had tried all three application, todoist is far better than others. Jithin, what is it about Todoist that you find “far better than the others”?? I posted my thought process on how I arrived at using it instead of the others, but I love to see what others are thinking. Quick question – you say “This list is linked to my Work in Progress list on the Process Street Blog Articles Trello board.” How do you link them? Is it with zapier? Or something else? Thanks for the great post with lots of details! I am surprised Priority Matrix by Appfluence is not on here (www.appfluence.com). Priority Matrix is a task management solution that will live up to all of your expectations. In Priority Matrix, you can create tasks at the touch of a button, set due dates, add notes, share files, delegate tasks, and comment on any task to share updates in real time, from all of your devices. It also has more advanced features like a calendar, a master list to see all of your items in one view, gantt charts, and much more! Thanks for the article! Helped me to make up my mind. Great to hear it! 🙂 Which did you end up choosing? Sooooo sad to hear about Wunderlist being reprised by Microsoft. I just went back into it and thought I would try to start using it because it has sub-tasks. But if they can’t do that, plus no filtering… Once again Microsoft thinks they know what people want and gets it wrong, killing a great program on the way. I’d imagine that Microsoft’s Todo app is just a transitory phase at the moment before they bake all of the old Wunderlist features into it. We can hope! I just had a read of your article and I have to disagree with you on one point! Any.do does actually integrate rather well with google calendar and google maps. Better than most I’ve gone through looking for one that suits my purposes lately, and I’ve been through a LOT. Otherwise, a good article. It’s nice to see someone else recognized the shortcomings to Wunderlist. One the problems I had with that one was that the app didn’t allow the user to set more than one reminder for a task. A task also couldn’t be set to cover a range of days, and personally, I found the wording of the reoccurring reminder options ambiguous. Thanks for the clarification! I’ll put this on my list of articles to update so I can include the bit about integrations. Now Wunderlist is shutting down, perhaps the team working on Microsoft ToDo — its replacement — will improve the product. Hey Benjamin, I’ve read the whole article, excellent and comprehensive reading. I would like to say something regarding the Microsoft To-Do. Most of the application and third-party add-ons only integrate with Gmail. And I just want to mention one app that integrates both with Outlook/Office365 and Gmail and is probably the best to perform so smooth. Any ideas on what would work best? So far Anydo I hated because I couldn’t even sort by date (said they were “working” on it). Todoist and Remember the Milk don’t show recurring events to eliminate the possibility of scheduling over the top. Trello was just too messy for me as I like to assign times, etc. Looking for something in the $30 per year range if possible. Any updates on your migration to todoist? I was using onenote for tasks and just manually copying a page from a template for repeat tasks. It was easy to get what I wanted but the interface wasn’t easy enough to use across all devices so I decided to check out Wunderlist, and then To-Do. I wanted to love these apps and while it was kind of fun migrating all my tasks over, I found myself fighting with the interface. Repeat tasks didnt’ function as expected…I would have repeat tasks based on month, week and day but the tasks would repeat and REMEMBER if I had “checked” a box or not. There are some circumstances I would want this, and others I wouldn’t. I also didn’t like that I had to define repeat options at task level VS list or folder level. I’ve observed all sorts of anomalies and thought I could hold out for “To-Do” to refine itself…but it hasn’t even added sharing yet so I may invest another day into checking out To-doist. Just wanted to know how it’s been going for you… Thanks for the article.